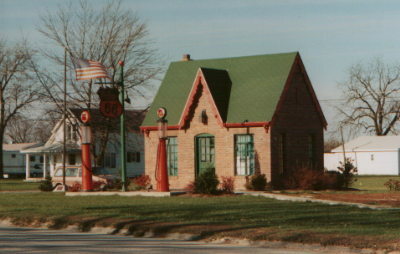 Old Phillips Station at Creston Iowa on the West edge of town on Hwy 34. Frank Phillips was born here. This is a brick, cottage type, now used as a tourist center. Building was moved over a mile from its original site, but in good condition. Has 2 visible pumps out front and a hanging Phillips sign. Easy to find, run by volunteers, so not always open.